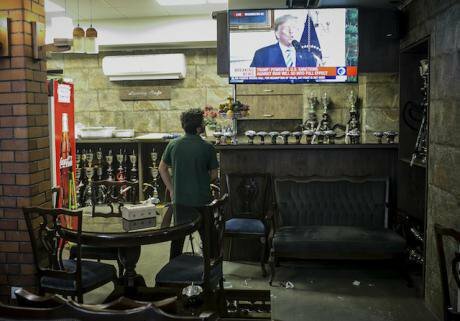 A man watches the news broadcast on U.S. withdrawal from the Iran nuclear deal at a teahouse in central Tehran, capital of Iran, on May 8, 2018. Picture by Ahmad Halabsiaz/Xinhua News Agency/PA Images. All rights reserved.The United States’ recent withdrawal from the Iran Nuclear Deal, also known as the Joint Comprehensive Plan of Action (JCPOA), has exposed some of the multi-layered dynamics of entrenched socio-political and cultural contradictions embedded in the very formative constituents of the Iranian nation-state. The debates over the (un)desirable repercussions of JCPOA have taken different expressions among proponents and opponents of the Iranian government; both signaled their deep apprehension about the possibility of a militarist intervention against Iran by the United States with the support of its regional allies. A cursory glimpse over the social media platforms in recent weeks reveals that a considerable number of Iranian intellectuals share with the hardliners and reformists the idea that the US decision to withdraw from the deal was fundamentally dictated by Israel, some Arab countries, as well as the US neoconservative faction, in an organized attempt to overthrow the Iranian regime. Appealing to a dozen conspiratorial accounts to explain the “invisible” causes “behind” breaking this internationally abided agreement, the Iranian nationalists jumped to the conclusion that the whole plan is to undermine the entirety and integrity of Iran by inciting ethnic and religious groups. However, they simply ignored the fact that Iran’s socio-economic fabric has already been destabilized by four decades of theocratic dictatorship that mobilized all resources in order to export the “Islamic Revolution” to the world. Having perceived Iran and Iranianness as “culturally consistent and unique phenomena”, they undervalue both the historicity and contingency of what came to emerge as the Iranian nation-state in less than a century. Such an ahistorical understanding is best exemplified in adopting and generalizing the politically forged binaries Iranian nationalists share with the regime, chief among them is the dichotomy of the separatist ethnic groups versus what is imagined as “pre-existed” Iranian patriots. In addition to constant warning against what they wrongly presume as “Syrianizing of Iran”, they have continuously expressed their deep concerns with regard to the potential ethnic revolts, something that denotes the long-standing idea of disintegration of the Iranian “nation” in regime ideological discourse. Overemphasizing the territorial integrity at any cost is a key point which brings to agreement many intellectuals of different ideological leaning (such as hardliners and reformers) of Iran. As Khomeini puts out: “the preservation of Nezam [regime] has the highest priority”. The Iranian nationalists’ captivation with the specific perception of the concept of Iran as one culture has long blinded them to see reality of the cultural diversity in Iran. In consonance with the government, the ethnic diversity is being described as an imminent and ever-present threat which jeopardizes the political existence of the nation. However, the question they never empirically attended to is: what is Iranian culture made of and, more importantly, how has Iran, whether as a culture or territorial entity, evolved? Stigmatizing the ethnic groups - who have inhabited the Iranian plateau for thousands of years – as a threat to a polity, which is historically justified by an imaginary past leaves the Iranian nationalists with two enormously lingering dilemmas: Firstly, is the Iranian nation synonymous with Shia and Persian dominant ethnic group? And secondly, how are the religious and ethnic groups represented in that existing imaginary political entity? The first question leads us to the appreciation of the ethnic diversity in which the Persian – Shia group constitutes but one ethno-religious element which has reserved political and economic monopoly over the other groups for decades. The second question draws our attention to the Iranian regime constitution which is centered on the marginalization of some ethnic groups, systematically deprived them of the equal share of cultural rights, political power as well as economic prosperity. However, there are important questions which Iranian nationalists either avoid or answer from a national perception of the past. These questions pertain to the cultural composition of Iran and its formation throughout history. Moreover, any act of stigmatization of ethnic groups, which have been part of this cultural geography of Iran for quite a long time, will leave Iranian nationalists with two dilemmas. The first concerns the question is the nation religiously and ethnically synonymous with the Shia and the dominant Persian ethnic group, respectively? The second dilemma concerns the representation of other religious and ethnic groups in Iran. Dealing with these dilemmas will make us regard ethnic diversity in Iran as a fact to be appreciated, although the Persian community has the dominant position, and draws our attention to the Islamic Republic’s Constitution, which marginalizes other ethnic groups as aquam [Qaum] with limited cultural rights. The advocates/supporters of JCPOA have also proved their tragic indifference to the domestic crisis the Iranians are grappled with on a daily basis. It is claimed that the deal benefited the Iranian people both economically and politically, whereas the post–JCPOA regime became more aggressive towards civil freedom, intensified political enclosure, and imposed pressure on Iranian civilians, eventually inducing popular protest throughout 2017 and 2018. The regime is neither reformable nor intends to safeguard their interests in the negotiations. Today, Iranian people, who have endured four decades of political repression, persecution, poverty, increasing economic inflation, as well as the state-sponsored violation of human rights, believe that the regime is neither reformable nor intends to safeguard their interests in the negotiations. Most Iranians have come to the point to consider the regime as their enemy, a ruthless and politically ambitious body which continues military interventions in the Arab countries such as Syria and Yemen. Moreover, Iran’s foreign policy includes the provision of generous financial aids to Hamas and other allies in Palestine and Lebanon, knowing that their country has already been sold to Russia and China which follow their own political and economic interests. All this is done by the Iranian government while hunger, starvation and lack of shelter continue to affect more people (for example, the people of Kermanshah who were hit by an earthquake a few months ago); Kurdish Kolbers [carriers], who engage with a dangerous cross-border trade between Iran and Iraq because of absolute poverty and destitution, are ambushed by Iran’s Islamic Revolutionary Guards Corps and brutally killed; political prisoners are executed; and civilians are mysteriously disappeared. Their privacy is constantly violated by the regime’s security services, and their dignity and respect has long been denied. These are serious socio-economic and political issues which are ignored by Iranian nationalists whose obsession with criticizing the west and imperialism as the sources of misery of Iran has blinded them to the regime’s internal colonialism, which is the replication of the same imperialist pattern and the imposition of a dictatorship at home. The regime’s territorial and ideological expansion in the Middle East and beyond is simply justified under the name of national security and the fear of regime change in Iran. Such unwise and unethical endorsement of Iranian regime under any name or justification will only serve the regime to continue its unbridled violence against its people, and further destabilize the region. Finally, the regime’s supporters seem to have missed two points in their understanding of the situation. First, the regime’s aggressive policies towards its people in the last four decades as well as its increasing and continuing interventions in domestic affairs of the neighboring countries, are alarming enough for us to be aware of its attempts to strengthen its military capabilities. Secondly, instead of focusing on JCPOA, it is the human rights in Iran to which the regime must commit itself. It is only in this way that the dignity of and respect for the Iranian people will be restored, saving the country from further political and economic collapse at the same time. This is the best deal for the people of Iran. Finally, while the American militarist attack is by no means a solution for regime change, the solution should come from within: that is, promoting a democratic process through which the cultural diversity, multi-ethnic characteristics of Iran, and socio-political equality are acknowledged by both the Iranian government and the people of Iran.